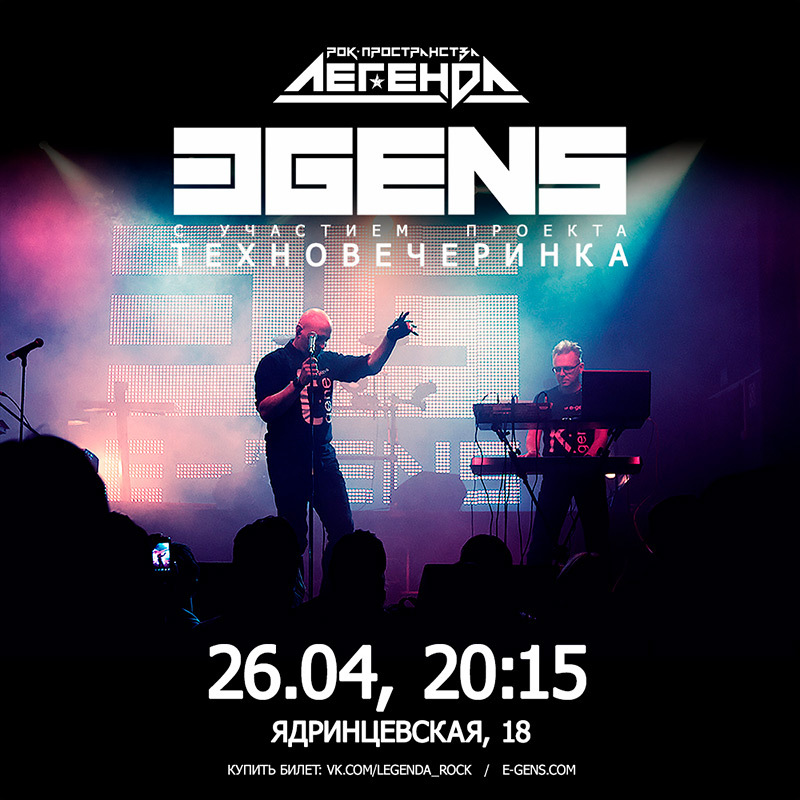 Sometimes they come back... E-GENS band (Evgeny Titkov and Evgeny Komarov) again go on stage on April 26 at the rock space LEGENDA in the city of Novosibirsk. Those who manage to buy tickets will hear, see and feel the breath of all the songs that were recorded by the band from 2007 to 2018. At 20:15, before the E-GENS band start, Yuri Yermolaev and Nikolai Kibirev will perform on stage (TEKHNOVECHERINKA Project). Tickets are selling through TimePad service. During the 3 remaining weeks before the event, the organizers, in the course of ticket sales, will play three branded CDs of the E-GENS band. Dear friends! Finally, the best independent music store on the web CD Baby, processed and checked all the data of the PROMETHEUS album. Now, apart from the iTunes and Amazon, the newest E-GENS' album 2018 - PROMETHEUS can be bought in mp3. After 5 years of silence E-GENS - faithful techno-romantics from Russia, appear in a new light with another studio album containing 15 songs in Russian! For more than 20 years E-GENS have been known as an English-singing band only. Today they present in Russian: 10 songs from the album Fine! Shine! (2010), 2 songs from the album Renewed Light (2013), as well as 2 brand new songs - Heaven and Prometheus. In February 2018 the band have signed a contract with ScentAir Records for the release of the album PROMETHEUS with a release date of April 15, 2018. CD will go on sale already on April 16 - 17. Digital sales will begin in largest digital media stores of the world on May 15. As part of the support for the album, E-GENS plans to give a series of live-shows in the current and forthcoming year in several cities of Russia and the World. The next studio compilation is to be released in 2019. It will include Russian versions of songs from the album Renewed Light (2013), and some new songs the band is going to record until the end of 2018. E-GENS give the world their albums for free! E-GENS, a Russian electronic music band from Novosibirsk, sang their songs in English from 1990, and focused on the audience of ageless techno-romantics raised on music of the 80s, decided to give a free download, copy, listen and play all their songs written and performed publicly in 24 years, from 1990 to 2014. The other day, all the E-GENS band members unanimously decided to give free access for unlimited time to all fans of electronic romance music. The decision is confined to the 5th anniversary of the public activities of the band. E-GENS will Take part and will perform in the concert dedicated to the memory of Alexei Neuromancer. He was the founding member of the famous Russian band NEXUS VI. The concert will be held in Tomsk - the hometown of Alexei on 12 April, on the day of the remarkable Russian Holiday called The Cosmonautics Day. We believe that the date chosen for this concert fits the occasion very well. After all, electronic music and the cosmos are some of the verges considered to be of great importance by many people. The aspiration to discover the mysteries of the universe have always existed in the history of humankind. Let there be glory to all space discoverers! Let there be eternal memory for you Alex! Notes: Limited Edition VIP Series 300 units worldwide. Licensed to A Different Drum for the Limited Edition VIP Series.